All business premises need at least 2 or 3 fire safety signs, however working out which ones you need and where you should put them can be confusing. Below we provide a simple guide. The Regulatory Reform (Fire Safety) Order 2005 – also known as the ‘RRO’ – is the cornerstone of fire safety in the UK and brings together all laws relating to fire safety in one place, not just fire safety signs. The Health and Safety (Safety Signs and Signals) Regulations 1996 apply specifically to safety signage. We provide a simplified guide to the RRO here. Fire safety signs are photo-luminescent so that the glow of the signs will help occupants make their way out of the premises or find fire-fighting equipment if the lighting fails during a fire. Which signs you require depends on the layout of your premises, the nature of their use, and the fire-fighting equipment you have. 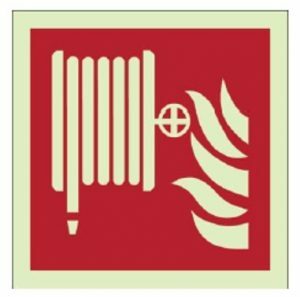 If you have a Fire Risk Assessment this document will outline exactly which fire safety signs you need. We explain more about each category of sign below. The Fire Action Notice’s purpose is to make sure that anyone working in or visiting your building knows what to do if they discover a fire or if they need to evacuate the building. There are different types of Fire Action Notice so you can pick the one that best suits your premises. All commercial premises must display a Fire Action Notice. Best practice guidelines recommend that you display a Fire Action Notice next to every Fire Alarm call-point, and at every final exit door, where they are most likely to be seen in the event of fire. If your commercial premises are small with a simple layout, you may not need a fire exit sign. 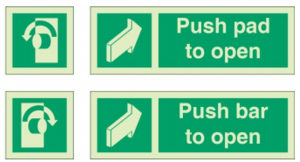 Fire exit signs are not a requirement if it is ‘obvious’ where the exit is, for example when there is just one door at the front of a small shop where it is clear that would be the means of escape. For more complex buildings however, fire exit signs are a necessity. What you specifically need comes down to how easily occupants would be able to find their way out of the building in the event of fire, especially if they’re not familiar with the layout. In some cases you may need a series of directional signs leading occupants along the shortest route to escape. These are familiar to us as green exit signs with arrows indicating which way to go. All fire exit doors must carry a ‘Fire door, keep shut’ sign. This is an example of a ‘mandatory’ notice, which simply means that it gives an instruction which must be followed for the building to be safe from fire. Depending on the type of exits you have, you may also need to provide instructions on how to operate the door, or indicate that a door opens automatically. Your fire assembly point should be far enough away from the building to avoid interference with the fire brigade and danger from falling debris caused by the fire. This means it needs to be clearly signposted. You may also need to take into consideration the type of occupants who will need to evacuate the building in the event of fire, making sure that the Fire Assembly Point is suitable for the young, old or disabled. In the event of a fire, it’s vital that occupants know where to find fire-fighting equipment, and which equipment they can use, depending on the type of fire. This is so the fire can be dealt with while it is still in its early stages. 95% of fires tackled with an extinguisher are extinguished within 2 minutes, so being able to locate the right type of fire extinguisher quickly is absolutely critical to the safety of your business. Fire extinguisher ID signs come in many formats so you can pick the one best suited to the location of your extinguishers. They can be fixed to a wall, or attached to an extinguishers stand. 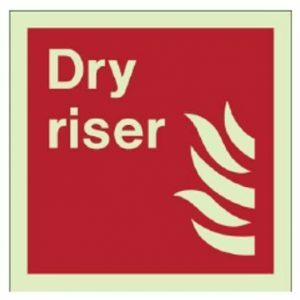 You may also need to provide fire safety signs for equipment such as hose reels and dry risers if you have them on your premises. 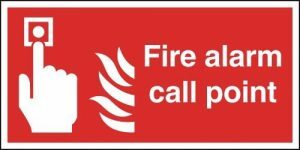 Perhaps most importantly of all, your fire alarm call-points must be clearly sign-posted so that occupants can easily find where to raise the alarm if they spot a fire. Every call-point should have a sign, and if you also post Fire Action Notices here, the person raising the alarm will have all the information they need to proceed. Warning signs are generally yellow and black, and often (but not always) triangular. They are designed to alert occupants to danger. In terms of fire safety, you will generally need a warning sign when you have flammable substances on the premises, such as gas or oil. Prohibition signs give ‘Do Not…’ style warnings in areas where there is a specific risk of fire. These are frequently used in conjunction with Warning signs, for example to prohibit smoking in an area where there are flammable materials. Warning signs are usually circular, with a red band around the outside and a diagonal red line across the centre. Often warning signs and prohibition signs are combined into one fire safety notice. We hope this guide has been useful to you. In summary, if you are responsible for the fire safety of a commercial premises, these are the signs that you must have and may need to have. If you would like specific advice on fire safety signs please feel free to get in touch, or take a look at our fire safety sign service here. ← Fire Marshal duties are key to keeping your premises, employees and customers safe.